Scarce large format map of Dalian, China. 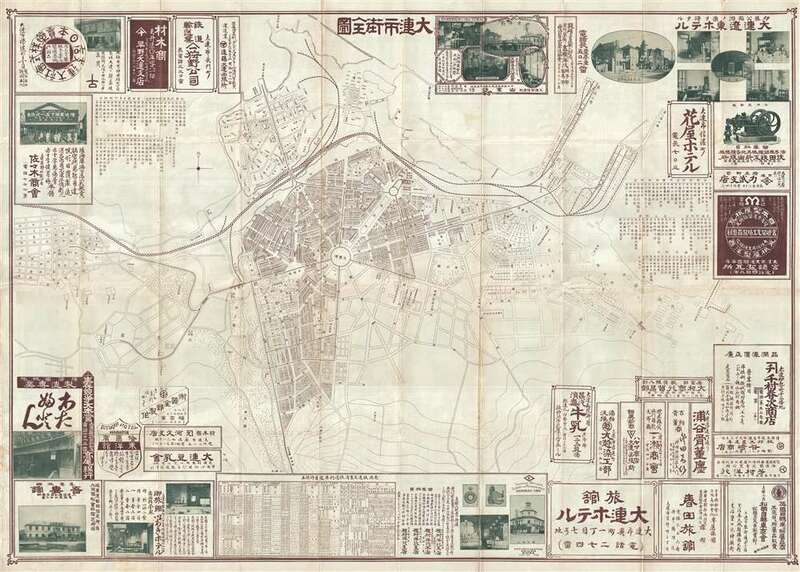 An uncommon and highly detailed c. 1910 Japanese tourist map of Dalian (大连市, Port Arthur, Darian), Liaoning, China. Centered on Zhongshan Square, this map offers a detailed picture of Dalian before the city's explosive post World War II development. In modern terms it covers, roughly, from the Huanghe Road Residential District to the Navy Square Residential District, and from Calian Port to Mount Liu. Graphic imagery surrounding the map advertises local hotels, restaurants, shops, and industry. The verso features additional advertising as well as photographic panorama view of Dalian. The map appears to be undated, but we estimate it to from the early part of the 20th century, between 1907 – 1920. Very good. Some wear on original fold lines.